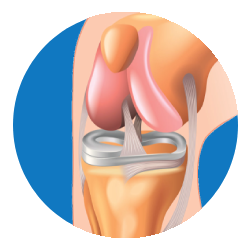 The Posterior Cruciate Ligament (PCL), located in the back of the knee, is one of the four ligaments that connect the thighbone (femur) to the shinbone (tibia). The cruciate ligaments control the backward and forward motion of your knee. Physical therapy: Specific exercises to strengthen the leg muscles can help restore your knee function. A surgery is done, if the injury has torn more than one ligament, or dislocated your knee.